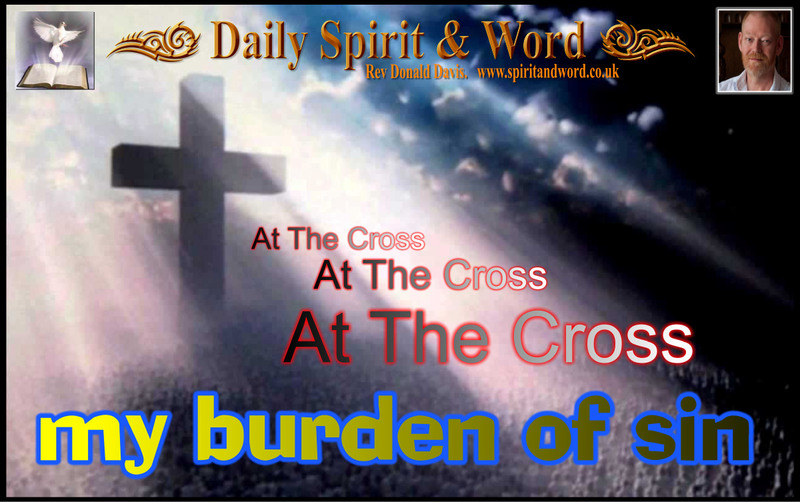 Daily Spirit & Word, 475: At The Cross, At The CROSS. Now, I AM Happy, All The Day. Every Day. Jesus knew the Cross was getting nearer, and as it weighed upon His precious soul, so His message of the Kingdom grew more intense. The heart’s desire of the Lord of life is that, not just the Nation of Israel be turned in repentance back to their God, but the whole world come to know the offer of Salvation. The Nations will put their hope in Jesus. This language is in stark contrast to what Jesus had been proclaiming in the rest of this chapter. And from that point on Jesus is headed for the Cross and instead of focusing upon the Nation, he’s revealing the Kingdom of God to the individual and to the world. My friends, it’s really windy out this morning, I love it, but I had to hang onto my hat it’s just so strong. When we come into the warm from such a blustery storm, it’s amazing how warm the house seems, how calm when you can’t hear the raging of the wind. The change in Jesus message is just like that; It is like coming out of a winter blizzard into the warmth of a spring day. Just like passing from a raging storm into a sea of calm. It’s like going from the darkness of night, into brightness of daylight. This is the same message from Jesus, but presented in a radical new way; He’d switched from a National perspective to a new message for the Individual. He changes from speaking to everyone in the Nation of Israel to EVERYONE in the WORLD. It is no longer the national announcement about a Messianic Kingdom but a personal invitation for everybody to find the much needed “rest” of Salvation. When Jesus speaks of being “heavy laden,” He is referring to the individual being burdened with sin. “I will give you rest” Jesus is the one who will enable you to find rest from your struggle to be good. Look back at chapter 11 of Matthew and you’ll see Jesus crying out to those Cities where He’d performed Miracles and they’d not REPENTED, they’d not received the Message of the Kingdom. So when Jesus is crying out to everyone, come to ME ALL you who are weary of carrying your load of sin and I will give you rest from your struggle to try and be good, I will lift your heavy burden of sin. My friends, sin is way too heavy a burden for you to keep carrying all your life. When you try and lift things that are too heavy for you, you can give yourself a hernia, and trying to live righteously without coming first to Jesus Christ to have the burden lifted is the exact same, you’ll really get a spiritual hernia if you try to carry your load of sin yourself. The only place in this world to put that heavy unbearable burden of sin is at the Cross of Jesus Christ. When He died there, He bore your sin and took it away from you onto Himself. Now He invites you individually and the whole world to come individually bringing your burdens of sin to Him. Jesus can forgive you because on the cross He bore the burden of sin for you and for everyone else in the world. “Come unto me, all ye that labour and are heavy laden, and I will give you rest” This is referring to the Salvation of the sinner through Jesus Christ. But the next phrase of Jesus, “Take my yoke upon you, and learn of me; for I am meek and lowly in heart: and ye shall find rest unto your souls” is referring to the practical sanctification of the believer. Oh WOWzer! I’ve just come back into the study after a short break from writing this, and I’ve seen the LIGHT. What a glorious sunrise, great colours in the sky and clouds. The storm is still raging, but the sky is full of light. The LORD spoke to me, “That’s what it’s like for those who follow me, there is a storm still raging, but there’s more light than they can imagine for their souls”. There is a REST that Jesus gives, and it is the rest of Redemption and Salvation from the heavy burden of sin. There is also a REST which the Believer Experiences, and it comes through; conversion, commitment and consecration of our lives to Jesus Christ. You don’t have to struggle to be Holy any more, because Jesus, with the help of God’s Holy Spirit, will enable you, but your part is to stay close to the vine, remain in Christ, to remain committed to living for Jesus, to be willing to submit to His burden of obedience to His commands. Remember what Jesus said, “My yoke is easy and My burden is light”. Yes you will probably fall from time to time, but Jesus transforms your heart’s desires. Once He’s lifted your heavy load of sin from your shoulders and carried them to the Cross for you, you will not have to struggle ever again when you are in Him and He is in you. We go out every week and share the Gospel with people on the streets, the vast majority are NOT burdened by their sins, they don’t care, they love sin and don’t want to hear about it. They’re happy to be without church, Jesus or religion. They’ll happily declare and some quite loudly, “I’m NOT religious”, what they’re saying is, “I don’t need someone telling me how to live.” and “I don’t want a God in the sky, who’s trying to control my life”… That’s why they need to hear the LAW of God before we share the GRACE of the Cross of Christ. It’s my experience that those who are burdened with sin are those who believe in Jesus, but have not yet been converted, regenerated or born again of God’s Holy Spirit. Yes they believe all the tenets of the Christian faith, they’ll willingly ascent to the creeds, but it’s all head knowledge, because they’ve not got to the point of letting go of their burden of sin and receiving Jesus as their Lord. It’s a simple transaction, but so many have not taken that step of faith. How have they come so far and a yet so far away? Because they may have responded to a ‘false’ gospel. One that says “Simply Believe in Jesus and you are a Christian.” Without REPENTANCE and without RECEIVING Jesus Christ as LORD, we’re still in our sins no matter how much we believe in Him. They’ll come in with their burden of sin, they’ll say confession in church, recite the creed and even receive Holy Communion, then they’ll walk out with their burden of sin still on their back. They are still trying with all their own strength to be good enough. It’s those un-regenerate believers in Jesus who’ve not been converted my friends, they are the ones who feel the burden of sin. They are like the Nation of Israel who had ‘religion’, but who didn’t know the Saviour and rejected the Messiah. We must preach, preach and preach again CONVERSION: IT’S the GOSPEL that leads sinners to repent of their sins and trust the Saviour. It’s the Holy Spirit who works on their hearts to enable them to feel the heavy load of sin, and it’s the law that leads people to an awareness of their need of a Saviour. However, until they come to Jesus and finally put their trust in Him for their Salvation, turning away from sin in repentance and from their own efforts to be good enough, realising that they can’t do a thing to shift the heavy load, they’ll finally dump their burden of sin at the cross. At the Cross, At THE CROSS. I love that old hymn: At the Cross, at the Cross… but we often miss out the most powerful first verse these days and just begin with the chorus, we’re happy to think of the cross, but not the conversion from sin that’s needed. Isaac Watts who wrote the hymn, knew what he needed to do to have the burden of sin lifted by the Lord Jesus Christ. Author: Isaac Watts (The Scientist and Inventor of the Steam Engine). My heart’s plea and the LORD’S today, is that you, you who are reading this, you who may believe in Jesus, but are still burdened with sin, will come and be converted, changed, transformed and translated from darkness into the glorious light. Your burden will be lifted once you trust the Saviour and take Him as your Lord. Matthew 7:21-23 21 “Not everyone who says to me, ‘Lord, Lord,’ will enter the kingdom of heaven, but only he who does the will of my Father who is in heaven. My friends, do you know Christ? Does Christ know you? Do you know Him as your LORD? Is Jesus Christ your Saviour? Come to the Cross of Christ and let Jesus remove your burden of sin, of guilt and of shame, then you’ll be able to enjoy the Son’s Light and “BE HAPPY ALL THE DAY”. AT THE CROSS, AT THE CROSS. You believe that Jesus died for you, good and so you should, but Satan also knows this, but he’s not turned in repentance, he’s still a rebel against the cause of Christ. You must believe and repent and trust and take Jesus as your Saviour. Believe, Repent, Receive. Stay blessed and keep close to Jesus today. Lord Jesus Christ, I believe that you died upon the Cross for my sins. I know that I’ve broken your Holy Law revealed in the Commandments, that you died there so that my heavy burden of sin could be lifted from me and transferred onto You. I turn now from all sin in my life and trust in Your amazing grace and ask for Your forgiveness. I receive You, Lord Jesus as my Lord and Saviour. I believe that You will send the Holy Spirit and give me new birth, new life and everlasting life. Please help me now Lord Jesus to live from now on for You and I want to serve in Your Kingdom. Help me to find fellowship with other Christians. I’m going to read and feed upon Your Word every day. Please open up the pages of the Bible by Your Spirit Lord, so that I can understand and apply them to my own life. In your most blessed and Holy Name I pray, Lord Jesus Christ. Amen! If you prayed that prayer, let us know by leaving a message here or on our Facebook Page, we’d love to be praying for you. It’s good that Christians or those who think they are Christians, re-visit this kind of prayer regularly, to remind ourselves of our commitment to the Lord Jesus Christ and His commitment to us. Read John’s Gospel today.